Like flowers in the spring, Auburn fans have finally started sticking their heads back up above ground and asking “Is it football season?” Hope springs eternal in the fall, especially with new coach Gus Malzahn back in Auburn– and, this time, with no one to tell him to slow down the offense. This year we will be introducing a new feature to our weekly columns here at the War Eagle Reader. We will be measure how many plays Auburn runs on offense each week and comparing the result to how fast Auburn wants to go. 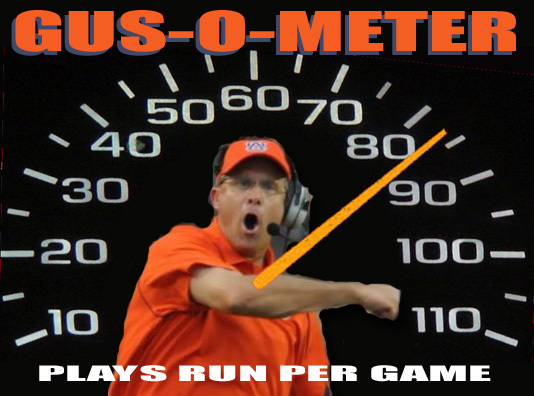 Gus has stated that his goal is 80 plays per game on offense (or faster). That would make the Tigers one of the three or four fastest teams in college football. This graphic is intended to show you how close Auburn came to that goal each week. 2012 Record: The “Cougs” went 3-9 in Mike Leach’s first season as coach. (Hey, that number sounds somehow hauntingly familiar.) The lone bright spot was a win in the “Apple Cup” over Washington at the end of the year. The low spot was easy – a loss to Colorado. Yes, they lost to Colorado. Starters returning: Offense 7; Defense 9. The offensive line is comprised of three former walk-ons and several undersized players. The center is 274 pounds and the right guard is 259 pounds. That would be pretty intimidating if this were 1946. Can they block Auburn’s defensive tackles? Can they protect quarterback Connor Halliday if he passes 60 times? Who should Auburn fans watch out for? WSU will play a lot of guys at receiver but Dominique Williams was the guy down the stretch for this team last year. WSU plays a 3-4 defense and was an attacking, high-risk/high-reward type of unit last year. They were in the top 20 in both sacks and tackles for losses – but also allowed a ton of big plays to other offenses. Playing the spread offenses of the Pac-12 was good preparation for Gus Malzahn’s Auburn offense. The defense has a lot of experience – but that experience consists of many of the same players who allowed 33 points per game last year. The key to the game may be which team tackles in space better. Both offenses want to get the skill players the ball in space and let them make plays with it. And so the winner should be determined by which team can make tackles and limit those plays. This is obviously something Auburn has struggled with the last few years, so we have to hope that the new defensive staff has made a difference in this area. Otherwise it’s going to be a long night and the scoreboard may need to add some digits. We think Auburn will be able to run the ball consistently, make some big plays with play action passing and make enough tackles in space to hold on and win what should be a really fun game to watch. In particular keep an eye on Nick Marshall running naked bootlegs and play actions off the bootleg. Sending him around containment and opening any kind of holes for him on the edge could result in big plays for the Tigers. What Else is Happening in Week 1 in the SEC? UGA at Clemson: A shootout between two great offenses and two suspect defenses. We like the home team, Clemson. Well, when we say “like,” we mean we favor for predictive purposes. Who actually “likes” Clemson as long as they have Dabo in charge? But this should be fun and probably the non-Auburn highlight game of week 1. Alabama vs Virginia Tech (in Atlanta). Scot Loeffler’s big shot at revenge! …um, no. This will not be competitive. Oklahoma State vs Mississippi State (in Houston): We like the cowboys over the cowbells. Big. The future of Dan Mullen at MSU is very murky at the moment. Can routine fifth/sixth/seventh place finishes in the SEC West keep the Bulldog fan base (assuming there is such a thing) happy forever? Do they believe the day will ever come that he will lead them to Atlanta? Ole Miss vs Vanderbilt: When did you ever think you’d say, “Oooh, let’s hurry home, or set the DVR—don’t want to miss Ole Miss vs Vanderbilt! !” But this could be a really good and very interesting game. We narrowly favor Ole Miss. But you certainly can’t take Vandy for granted anymore. Previous Wishbone: A New Day: The Wishbone’s 2013 Auburn Tigers Preview. WDE! I’m on the Gus bus an excited about him as our new coach! Looking forward to some good football’!!!!! I didn’t realize until yesterday that the Ole Miss/Vandy game comes on so early. It was a moment of pure joy when I realized I was getting college football earlier than I originally thought.